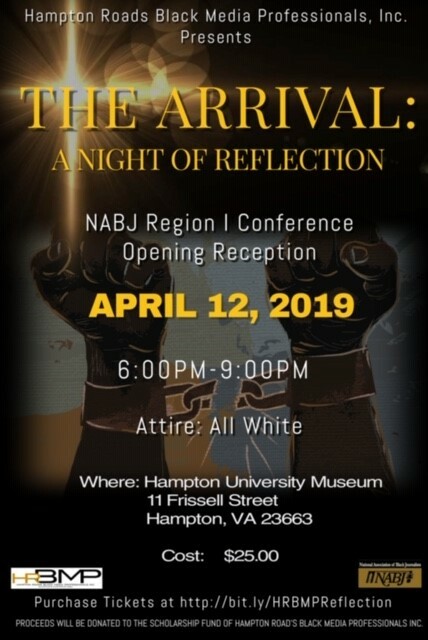 Join members of the local chapter of the Hampton Roads Black Media Professionals Inc. as they kick off the Opening Ceremony and Fundraiser for the 2019 National Association of Black Journalists Region I Conference. Join us for a night of reflection and adventure as we explore our history and pay homage to the 400th anniversary of the first documented enslaved Africans’ arrival to the North English Colonies. The Opening Ceremony will include live entertainment, story-telling, museum tour, light hors d’oeuvres, dedication ceremony, special guests, and a lot of fun.